An example of a defaced boulder in Rattlesnake Canyon. A rash of graffiti hitting Joshua Tree National Park, possibly the work of vandals trying to one-up each other on Facebook, has prompted officials to close another part of the California park, and left visitors and conservation groups outraged. Just weeks after a spike in graffiti forced officials to close access to the park’s Barker Dam, “recent and increasing acts of vandalism” have now prompted an emergency closure of the Rattlesnake Canyon area until April 30, an alert on the park’s website announces. About 17 different sites in the canyon, mostly boulders, have been defaced with spray paint, said Pat Pilcher, a spokesman for the park. Some of the graffiti is vulgar and obscene. In some cases, the vandals have painted over ancient petroglyphs found on the rocks, he added. “It is disturbing,” Pilcher told NBC News. 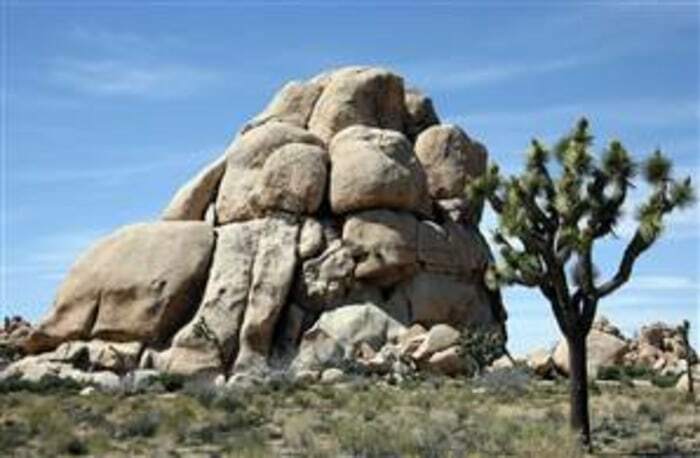 A rock formation at Joshua Tree National Park. Officials suspect social media posts are fueling the incidents, with the vandals apparently trying to outdo each other after posting photos of their misdeeds on Facebook, Pilcher said. Photos of some of the damage released by the National Park Service show two boulders extensively covered with blue, black and white spray paint. Pilcher declined to say whether the park has any leads on who the perpetrators are or how much it will cost to clean up the damage. Someone spray painted the dates '92 and '94 on this rock but the graffiti was added within the last month, officials said. The incidents started earlier this year at Barker Dam, with people spray painting messages and carving their initials into the face of the dam, prompting officials to close access to it in February. A popular nature trail nearby is still open but visitors can’t walk up to the dam face anymore, Pilcher said. Now, rangers are dealing with similar damage in Rattlesnake Canyon, which comes off the northern edge of the park and contains large granite boulders, some measuring 50 feet in diameter. Visitors finding out about the damage are “astounded, shocked and appalled,” Pilcher said. About 1.3 million people come to the park each year, with April one of the busiest times of the year. The closures mean tourists won’t see key parts of the park. Shteir, who lives about 15 minutes from the entrance of Joshua Tree National Park, said the vandalism has shaken the community, which depends on park visitors to fuel the local economy. The National Parks Conservation Association is also concerned budget cuts prompted by the sequester have left national parks less able to prevent and respond to such incidents, Shteir said. Meanwhile, the National Park Service hopes the public can help catch the culprits and thwart any additional vandalism. Visitors who see any “damaging activities” are urged to report them to the visitor center or local law enforcement, Pilcher said. If convicted, the maximum punishment for a perpetrator is a $5,000 fine, six months in prison and three years of probation.